Daily Spirit & Word: 726: Don’t Give-Up On Seeking The Lord. The Unjust Judge Gives IN to Persistence. Good morning my friends, do you know how our Nation is the way it is today? It’s because minorities complain the most. It gets to the point that the one’s they are complaining to just cave-in and give them what they want. I’m sure they do it for good reasons, but one can’t help thinking they’re doing it just so the once complaining will go away and stop grumbling, nagging and hen-pecking . However, once they’ve gotten their way once, they’ll be encouraged and emboldened to come back and push for more. By Josh Billings: An American Humourist. A ‘kicker’ in Josh’s day was someone who complained a lot. The ‘wheel’ that does the ‘squeaking’ (i.e. the ones complaining the most) get what they’re asking for. 2 He said: “In a certain town there was a judge who neither feared God nor cared about men. Jesus wanted to show us Father God’s attitude towards justice, i.e. How God wants to see that those He loves will get justice, and quickly. But, do you remember how long it took for Nelson Mandela? 25 YEARS in Prison on Robin Island. In the end, his patience, persistence and fortitude won-out and South Africa is now FREE from Apartheid. Do you remember Jacob, how he wrestled with God all night? He wouldn’t let go of the LORD until he received his blessing. 22 That night Jacob got up and took his two wives, his two maidservants and his eleven sons and crossed the ford of the Jabbok. We must bear in mind what was happening with Jacob when he wrestled with God: Jacob’s name means “Deciever”, but a more literal translation of his name is “Grabber” or “Grasper”… He came out of the womb grasping his twin brother Esau’s heel. Later on he deceived his father and grabbed, grasped his brother’s birthright blessing. He was fleeing his father-in-law Leban because he’d sneaked away in the night with all his possessions. Now he was headed home to meet-up with his brother who was hell-bent on revenge and had threatened Jacob’s life. So what did Jacob do? He’d sent everything he owned, including his wife and children and all his precious possessions ahead of him to pacify his brother’s furious anger. He was left with nothing but himself. God came to him and he wrestled with the Angelic presence of the Lord. Jacob grasped, grabbed hold all night until he got his blessing. He also got a name change “One who wrestles with God”. Has there been a time in your life when you’ve prevailed in prayer, kept going, believing, having faith, not giving up; until the Lord blessed you? There was a lady I knew who couldn’t conceive for over eight years, she’d tried everything, but one day she came forward for prayer in church. A few weeks later her mother (who I didn’t know) came running up to me in the street and shouted, “You got my daughter pregnant”… First I thought about arguing, thinking in my head she was accusing me. 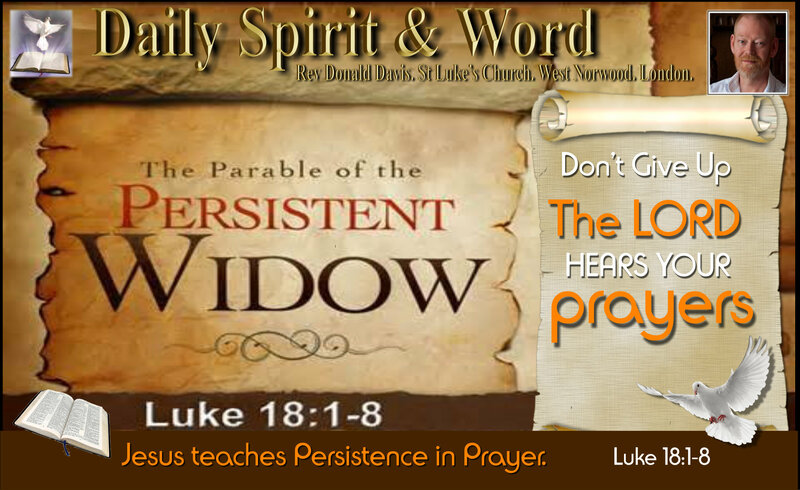 How foolish, she was just overjoyed, because the LORD had answered her daughter’s prayer. She didn’t just have one baby, she had twins. The Lord gave her more than she bargained for. Sometimes we don’t get our answers for a long time, because we come to God last. We try everything else, but God. My friends, when you’ve got something going on in your life that you need help with, something your striving or struggling over, come to the Lord with it first. My friends, Jacob didn’t deserve God’s blessing. BUT: In His mercy and grace, He’ll give us what we need. If it’s justice, as in the case of Nelson Mandela, God gives it quickly (though not our version of quickly). If it’s seeking; God’s guidance, power, provision, protection, forgiveness, mercy or Justice, then know this my friends, God hears the prayers of those who pray in faith. Jesus told that story of the Persistent Widow to show us how to KEEP coming to the LORD, so we wouldn’t give up on seeking God. God’s not encouraging us to be ‘grumblers’, in fact the Bible tells us not to grumble, but He’s encouraging us to keep going, to keep coming to Him for everything we need in life. Have and awesome weekend, keep close to the Lord Jesus, be filled afresh with His Holy Spirit and don’t give up on prayer, because your answer might just be around the corner. God HEARS you, so keep praying in faith, believing and trusting in Him who loves you. P.S. Remember the great old hymn: “What a Friend we have in Jesus”? No Prayer – No Power. 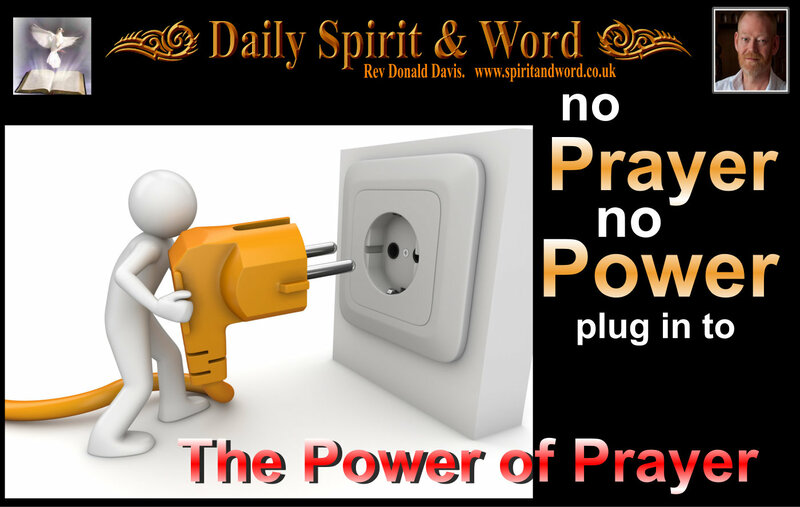 Daily Spirit & Word, 480: No Prayer – No Power. Plug into the POWER of PRAYER. Good morning my friends, we’ve just had a wonderful few days over the Easter Bank Holiday Weekend, with family, friends and awesome fellowship. Easter Sunday was an exciting celebration of the Power of the Resurrection of the Lord Jesus. There are times in the life of every believer when we feel low, when we don’t feel close to the Lord and when things seem to get hard both spiritually and emotionally. Quite often that will happen after a wonderful time of close connection with Jesus and an encounter with the Holy Spirit. When that happens to me I get back to spending longer times in prayer with the Lord, and more often than not I begin to wonder, “Lord, what are you saying to me through this?” The Lord is so gentle and kind, because He’ll lead me back into His ways and He’ll gently show me or remind me what I should have been doing or ought not to have done. You all know one of my mottoes in life is: No Read – No Feed… If I don’t read God’s Word then I’m not going to be fed Spiritually. It’s the same with Prayer: No Prayer – No Power. When we are prayerless, then we’re going to powerless as followers of Jesus. Think of prayer as a way to charge you up spiritually as one would your mobile phone. We’re always charging our phones to ensure they have enough power to see us through the day, but do we spend quality time charging in prayer with the Lord Jesus? Little Prayer = Little Power. Quality Prayer = Explosive POWER. First; No Read – No Feed: Sometimes it’s a lack of real engagement with the Word of God; I’ll be reading it, but then at the end of a passage or even a whole chapter, I’m left wondering what I’ve just read. Then I realise, I’ve been reading without thinking, reading without paying attention to what I’m reading, so the Lord guides me to go back and read it again. I’ve done that so many times, when I’ve woken up tired from a late night or been up during the night and just begin reading God’s Word automatically or out of routine. Then BAM! It hits me, I’ve been reading God’s Word as if it’s a Newspaper or an Advert: skim reading and not dwelling upon it or reading it prayerfully. That’s quickly followed by a confession and repentance and return to devotional reading, seeking the Lord for His light from His Word. You know my friends, I can confess to you right now, that these are some of the most powerful and profitable times in God’s Word. You see God didn’t call us to be like robots or to do things out of duty or routine, but always seeking to engage and talk with one another. That’s what should be happening when I’m reading His Word, because it’s His living Word and He wants to speak to me through His revelations and give me fresh revelations every single day. 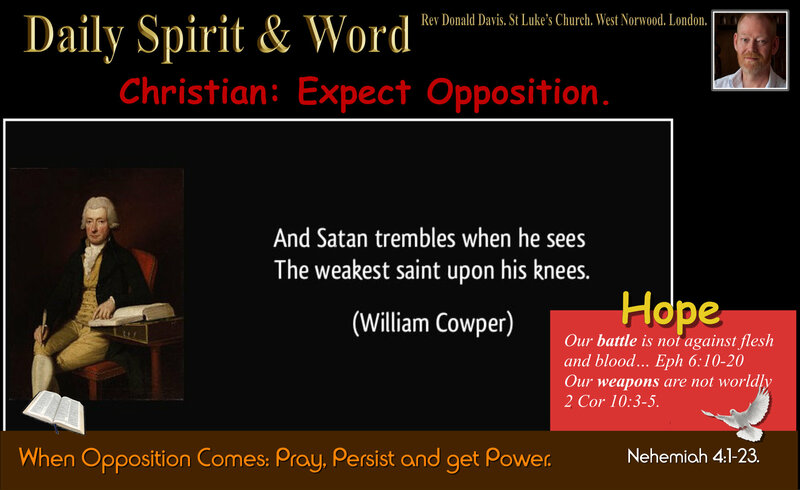 Secondly: No Prayer – No Power. Then I’ll sometimes get convicted about my prayer life or more specifically my lack of engagement or communication with my Lord. You see Jesus wants us to know that when we pray, he’s right there with us, He’s not some distant deity that we have to emplore to be touched by our works our devotions or our dedications. No my friends, Jesus is right there and wants us to know it, the moment we turn to Him in prayer, His desire is to communicate and be with us. How awesome is that? Jesus is not impressed by how we posture ourselves or about how holy a place we’ve found to pray, what He’s impressed with is a heart that desires to know Him and be with Him and spend time in His company, a heart that desires to do His will, to live in accordance with His commands, for Jesus knows that when He gets a heart of a human being in the morning like that, that we are truly loving Him for who He is and not just what He can do for us. When we come to Jesus in prayer and come to His Word with our focus and attention and heart right, then we’re going to get the power encounters that all the ancient saints of old and down through history have experienced with the Lord. Like Moses, Joshua, David, Elijah, Elisha, Daniel, we’ll get revelation and power. They all plugged in and got the power. When we Read God’s Word and Spend Quality Time in Prayer, then we’re going to be fed and powered up for following Jesus today. It’s amazing what people down through the ages have called this parable; “The Parable of the Persistent Widow” “The Widow that never gives us”. But it could also be called “The Parable of God’s Desire for Justice”. It just depends upon our focus; are we thinking about earthly things or heavenly things. Where your treasure is there your heart will be also. If our heart’s desire is to be God’s person, then we’ll be concerned with Heavenly things. God’s desire is that people always get justice and Christians should always be on the side of fairness, equality, justice, mercy. Giving aid and assistance to the poor and those who can’t care for themselves. Once we know the Lord and His deeper desires then we’ll also act in accordance with God’s character as well. However, just as the widow was persistent until she got the unjust judge to listen, we’ll also continue in prayer and never give up until we see that justice is being done. We’ll pray and act and then we’ll see the POWER of Heaven released. We’re not to just to pray, God’s much more concerned about How we live in this world and about how we’re being obedient to what He’s already revealed. When we come to God in the morning and we’re ready to do His will in the world that day, don’t you believe that He’s ready to listen to your petitions? Oh yes my friends, David and Abraham were called the friends of God, because their hearts were filled with a desire to trust Him alone. Abraham believed the Lord and it was credited to him as righteousness. David was a man after the Lord’s own heart. They both desired to do His will. No Read – No Feed. Go on my friends, get close to Jesus right now: Pray and Feed upon His Word. You’ll get Power to sustain you throughout your day. You’ll be fed and nurtured by God’s Word to equip you for the fight of the faith. It’s your only weapon against the enemy. Prayer: Oh Lord, let me come to You and to Your Word ready to listen, to pay attention to what you’ve got to say to me every single day. Let me have a heart that’s ready and willing to obey what You are telling me. Show me Lord the areas of my life, that I’m slipping up in: is my prayer life right Lord? is my Bible reading right Lord? is my heart attitude towards others right Lord? I’m desiring to live my life Your way Lord. I want your power in me, I want to know your Word. Help me to be like David and Abraham, I want to be called a friend of God and friend of Jesus. I know that you are my friend Lord, but help me to live every moment knowing my best friend is with me wherever I go. Amen. You know my friends, when you pray like that God’s going to show you things in His Word and He’ll answer your prayers quickly. So don’t ever think of quitting or giving up, but be like that widow, be persistent in prayer and the Lord who loves Justice, Mercy, Patience, Kindness, Goodness and Gentleness will answer your prayers quickly. Amen!